Mike White has done a whole lot to make the transition from Billy Donovan to him as smooth as possible. In three seasons he’s taken the team to an NIT, followed by an Elite Eight and a trip to the Round of 32, and each recruiting class has been better than the last culminating in a 2019 group currently ranked #2 in the country. But there has been one snag. Just a minor one, mind you. But an annoying one, nonetheless. It’s that darn Tallahassee school. Florida State has had Florida’s number the last few seasons, and I don’t mean just in football, but in basketball. 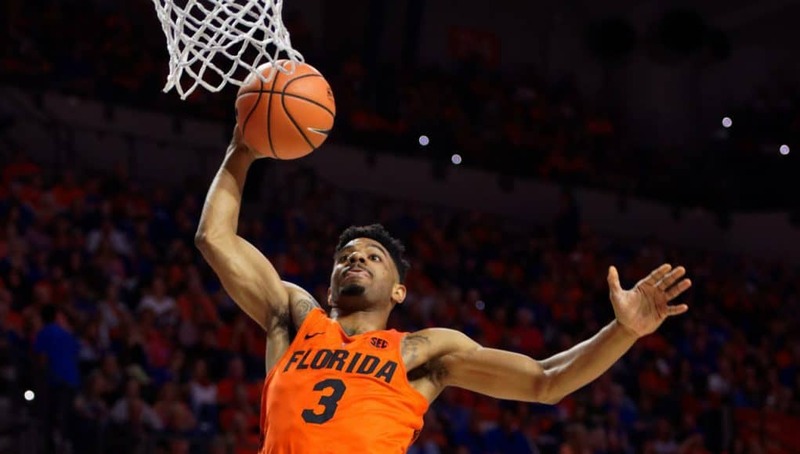 The Seminoles have won 4 straight meeting with the Gators, a streak started in Billy Donovan’s last season when Jacob Kurtz’s “own goal” at the buzzer gave the Gators one of the most unfortunate losses in team history. The last win against the Seminoles was with the amazing 2014 squad, but it was only a one-point win by our eventual Final Four team against a Florida State team that ended up only making the NIT. If that doesn’t show you how pesky FSU has been against us, I don’t know what will. Mike White is a career 1-4 against the Seminoles and is 0-3 against them while at Florida. He actually faced them twice while he was at Louisiana Tech and actually had the slight upper hand in my opinion as he only lost to them by three in 2014 but beat them by five in 2013 (both in the NIT, both in Tallahassee). The worst loss to Florida State was this past season as the Gators absolutely laid an egg at home and lost 83-66. 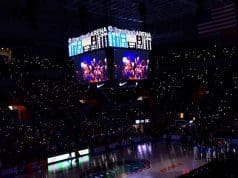 With the Gators opening up the 2018-2019 season against FSU let’s take a look at why the Seminoles have had the upper hand and what the Gators can do to start the upcoming season off with a win. With how well Florida State has recruited, you’d think they’d be one of the powerhouses in college basketball. Here is where their recruiting classes have ranked nationally the last few years. Those are three really good classes in a row between 2015-2017, really interestingly coinciding with the years they have been beating Florida as the Gators’ recruiting took a slight dip during the coaching transition. Though recruiting rankings aren’t everything and the Seminoles did lose some of their high-end talent to early NBA entries it makes sense why they might have a bit of an edge in talent over these last few years. 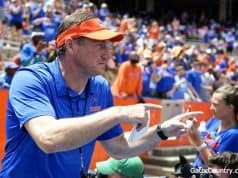 This should change with this upcoming matchup as the Gators have been steadily bringing in more talent and with the Gators’ 2018 class looking astonishingly better than the Seminoles’ (who obviously only brought it one player who was a 3-star), the raw talent should be similar going forward. Florida State coach Leonard Hamilton is committed to playing big and his teams have towered over the Gators in recent matchups. While a lot of basketball has trended towards smaller players the Seminoles have stayed big and the trend towards smaller lineups has only made the difference is size more noticeable when the Gators see them at the jump circle. Here are the yearly rankings for Florida State when it comes to team height. Let’s contrast that with how the Gators have ranked. So the Gators weren’t tiny, but they certainly weren’t in the same weight class as the Seminoles. As much as some people think size doesn’t matter in basketball anymore, it still plays a major role. Florida has gotten pummeled in the rebounding department, has gotten their shot blocks on drives, and have gotten scored on inside as they struggle to match up. You see, it’s not just that Florida State has had size sitting on the bench, it’s that they have functional size. Last year’s starting lineup had 6’5” Trent Forrest starting at point with 6’4” PJ Savoy, 6’6” Braian Angola, 6’6” MJ Walker, 6’6” Terance Mann, and 6’8” Phil Cofer all in the wing rotation providing length and versatility. Meanwhile, the Gators struggled to match up with 6’0” Chris Chiozza and 6’2” KeVaughn Allen. The length Leonard Hamilton has consistently rolled out has provided issues for the Gators and going into this matchup they’ll have to find a way to create ball movement and get the hoop despite miles of arms and hands getting in the way of lanes. The biggest player for the Gators to deal with is going to be Christ Koumadje, a 7’4” senior who has made a career out of protecting the paint with an iron fist. With Chase Johnson and Isaiah Stokes entering this year’s iteration of the rivalry the Gators should have some more frontcourt options, but dealing with Florida State’s size isn’t just about the big men, it’s about guards and wings. How the Gators deal with that could mean the difference between a win and a loss. As previously mentioned, last year’s matchup was a 83-66 stinker where the Gators hung in until halftime only to get outlasted and then dominated by the bigger, stronger, and more athletic Seminoles. This might have been Chris Chiozza’s roughest game of the season as he went 0-5 from the field for 3 points (all free throws), 4 assists, and 4 turnovers. The Seminoles threw multiple long, athletic defenders at him that used their size to deter his passing ability and force him into a lot of tough situations. Terance Mann dominated offensively for the Seminoles scoring a hyper-efficient 25 points largely on layups as he went 11-14 from 2-point range. The Gators had a roster limitation last year that was really exploited by the Seminoles and it’s the fact that they didn’t have anyone who could play shutdown minutes on the wing. Jalen Hudson, Egor Koulechov, and Deaundrae Ballard all really struggled to slow down Mann on the wing, as well as Phil Cofer and Braian Angola who also got to the rim at will and forced a ton of fouls from the Gators’ perimeter core. Keyontae Johnson is theoretically the best player to step into this role going forward, though as a freshman he may not be able to take on this role with Florida State game being the first one of the season, and his career, but the Gators will need to find a way to deal with Mann if they want to win this one. Florida State gets home court for this season’s matchup but that shouldn’t scare you much. According to KenPom, the Donald L. Tucker center was only the 120th home court advantage last season which doesn’t scream a really difficult place to play. If the Gators were to get this rivalry shifted back in their favor, doing it on the road would be a nice place to start. 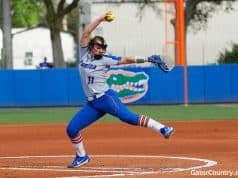 With the Gators looking to get their season off on the right foot they’ll need a great effort against a good looking Florida State team that returns a lot of their roster from last year. With Coach White righting the ship with back to back NCAA Tournament appearances and rapidly accelerating recruiting excellence, it’s time he puts this Florida State losing streak to bed.